While our focus was on the members of the Class of 2019 during our time at the AAU Super Showcase last week, we did manage to find time to check out some younger teams that were playing up at the event. This group was essentially Team Knight’s 16U team playing up in the 17U Showcase. This gave us another chance to watch 6’4 guard Ivan Reynolds. As we noted earlier, Reynolds directs the offense for the team and the lefty does a solid job in that role. He has good awareness and court vision, moves the ball quickly to open teammates and his size allows him to see over the defense, make the right read and get the ball to the right place at the right time. Reynolds is more slasher than shooter as he got all of his points save two on trips to the foul line after driving to the basket. He anticipates well at the defensive end and comes up with more than his fair share of steals. Also playing well for Team Knight Mix was 6’5 wing Nathan Montaque. He was solid in his offensive play inside the three point line as he consistently knocked down fifteen to eighteen foot jump shots as well as got to the rim and scored after a couple of dribbles. Montaque was an active offensive rebounder and got up and down the floor quickly in transition. Another 16U group playing up, CP 25 played well against older, more experienced players. Eric Butler (pictured above), a 6’2 guard, impacted a great many plays in the game we watched. Thanks to a quick first step, Butler routinely got into the lane and made the right decision with the basketball. Sometimes he took the ball all the way in for scores or free throw opportunities while at other times his dished the ball off to open teammates. He’s very active defensively and his tip of an inbounds pass preserved the team’s two point win in the contest we watched. Darius Johnson, a 6’0 guard, was solid as both a distributor and shot maker for Team CP 25. He makes good decisions in transition, looks to get the ball inside in half-court sets, and keeps the ball moving on the perimeter. Johnson is a good shooter from beyond the arc, both off the catch and the dribble and generally makes the right read coming off of ball screens. This group of rising sophomores played in the 16U Super Showcase. Coaches from Xavier, Ohio State and Michigan watched their game against All Ohio Red, so they were playing a good team and not surprisingly learned a lesson. However, it was no doubt a positive to play in front of high major college coaches at such a young age. Craig Starks, a 6’6 forward, has come a long way in a short time since we saw him in June. He was much more active offensively around the basket, scoring quickly thanks to his leaping ability. Starks also has a quick second leap and got more than a few offensive rebounds that way. Though undersized compared to the opposition, he challenged and changed several shots on the defensive end. Kanye Jones, a 6’1 guard, was unintimidated playing up a year. While his outside shot failed to drop, he did find some success in driving the ball to the basket. Jones’ activity on the defensive end earned him some opportunities in transition. From what the coaches told us, Jones has played well this spring and summer so it should be interesting to watch how that translates this coming high school season. 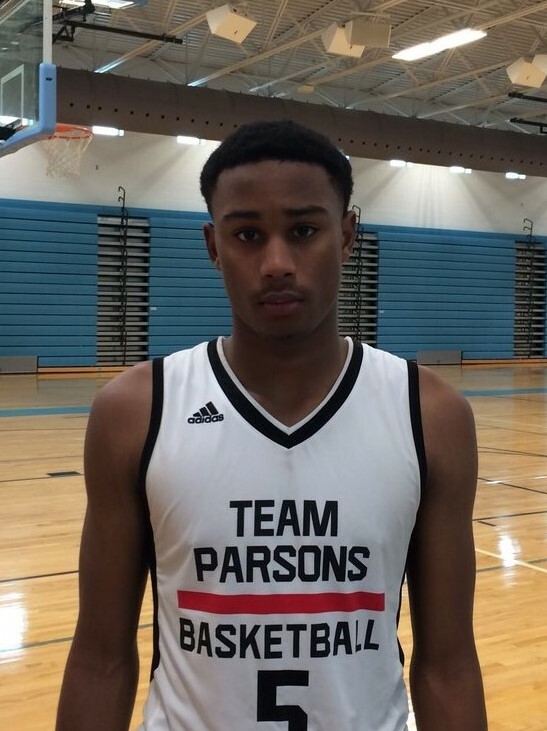 We first noticed 6’6 forward James Henderson back in June at the USF Team Camp. Fast forward a month and his growth as a player is obvious. His high motor and hustle paid off in terms of offensive rebounds, points in the paint, and blocked shots. Henderson was one of the few who was physically able to matchup with the older opponent. We are hoping that his playing for a small, private high school doesn’t stunt his growth as a college prospect.